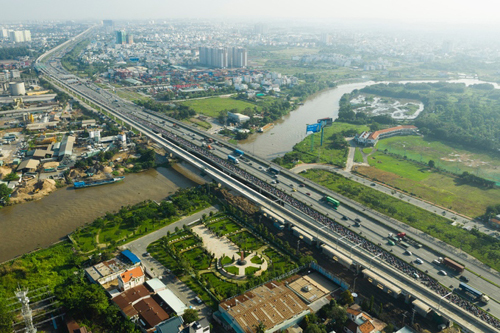 Deputy Prime Minister Trinh Dinh Dung confirmed the completion of the schedule by asking HCM City to assess and approve adjustments to the overall project investment. The government office is deputy prime minister Trinh Dinh Dung Than – Tham Luong at a meeting on the total investment adjustment of the urban railway project in Ho Chi Minh City Line 1 (Ben Thanh Thien) and Line 2 (Ben Thanh – Suoi Tien). Deputy Prime Minister asked the Planning and Investment Department, the Ministry of Transport, the Ministry of Construction and the People's Committee of Ho Chi Minh City to strictly observe the guidelines of the Financial Bureau for the total investment adjustment of the two Metro projects. The Ministry of Planning directs Ho Chi Minh City's guidelines to assess and approve adjustments to the total project investment. To the Prime Minister and the permanent government. Ensure the quality is complete on time. Metro Line 1 started in August 2012 with a length of about 20 km. Picture : Fukoa. 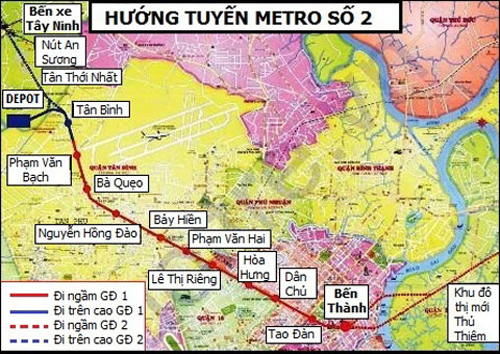 Subway Line 1 – Ho Chi Minh City's first urban railway, which began in August 2012, passes through 1, 2, 9, Binh Thanh, Thu Duc (HCMC) and Di An district, almost 20 km. (Binh Duong). Of these, 2.6 km is subway (3 stations) and 17 km (11 stations). Currently, the project has completed more than 50% of its total investment, but capital is always "hungry" because it has not agreed on total investment. In 2007, the city approved the project with a total investment of about 174 billion dong (more than 126,500 million yen). The project is then determined to belong to Group A in order not to submit investment policies to the National Assembly. Subsequently, the total investment in 2009, which was calculated and redefined by the project's general consultants, surpassed VND 4.73 billion (23.55 billion yen). After consulting with ministries, the Prime Minister allowed the Municipal People's Committee to approve the project coordination in August 2011, and the total new investment was over VND 4.73 billion. Currently, however, the project must be submitted to the National Assembly for investment policy approval. Subway line 2 map. Line photo: Ho Chi Minh City Urban Railway Management Committee. Metro Line 2 (Ben-Tanloon) was approved for a total investment of more than $ 1.3 billion in 2010. Asian Development Bank (ADB) $ 440 million; From the German Rebuilding Bank (KfW) for $ 333 million and from the European Investment Bank (EIB) for $ 195 million. After that, the proposed capital increases the price of slip, finance costs, construction (metro line connection for additional 3b, 5 metro length. It is one of eight approved subway lines about 20km (Thu Thiem – Tay Ninh bus stop) from Ho Chi Minh City and is divided into two phases. This subway line will start in 2020 and is expected to be completed soon in 2024.